This morning, I found out from my dad that there is a cyclone in Oman. At first he told me that there were heavy rains and I thought that was odd because it never rains in Oman this time of year. Then he said that it was due to a cyclone (that’s what hurricanes are called on that part of the world). 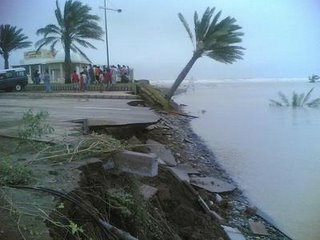 Apparently Cyclone Gonu reached the strength of a Category Five hurricane while it was over the Indian Ocean. However, it only hit the Oman coast at a strength of 60%. But that was enough to cause widespread flooding. Apparently, the wadis (seasonal streams) are overflowing. 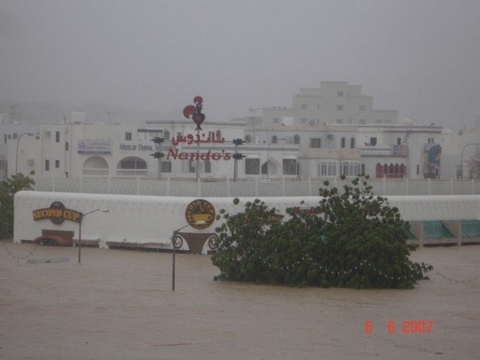 I hope everyone in Muscat is ok. 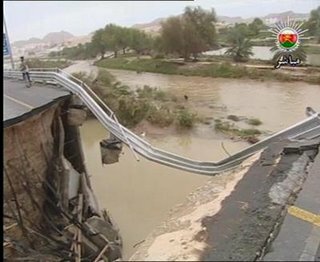 The Omani Army is on alert and schools have been converted into emergency shelters. No deaths have been reported so far. 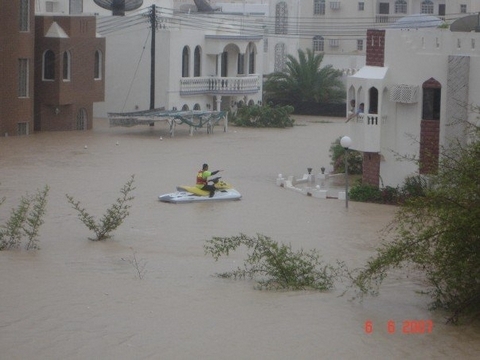 Omani authorities have asked everyone to stay indoors. The storm seems to be dying down although heavy showers are still expected. Today (8th of June) I got a chance to look at the aftermath of Gonu. My parents called me last night and told me that things in Oman are pretty bad. They are staying put in Dubai at my uncle’s place. There was no way for them to get from Seeb airport to their house. The roads were flooded. Low-lying areas like Qurum were completely submerged. I saw the pictures of the aftermath today. Roads have completely caved in. Bridges and walkways are just gone. All of Qurum – it’s all gone. Completely damaged. I have no idea what they are going to do to those homes and all the shopping malls they have in the business district. There is so much water damage. The Omani roads weren’t built with to handle this kind of weather. It looks like the water washed away all the sediment underneath the roads, leading to cave-ins and craters. 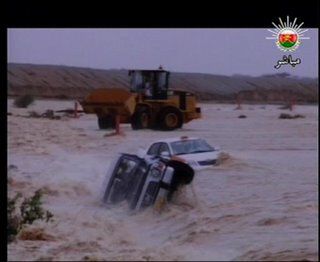 I heard that places like Wadi-Kabir and Al-Ghubra experienced flooding too. I wonder how my school is doing. My parents’ house is fine. They live in a place that’s kind of high. I don’t know if they have anything set up for international donations. Currently they have something that accepts donations from Omanis only. But please spread the world. These people need help. Thats crazy, this ruins my misconceptions (dry desert with not a drop of rain) of the middle east. Those are some wicked pics vivin. I know! I was surprised too when I heard about the rain. I just hope everyone is ok! 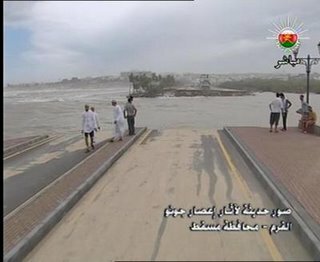 I was surprised to see and hear on TV about the cyclone and heavy rain in Oman. Rarely we hear any news from Oman here in Canada. I was in Oman for almost 15 years and the news brought back all the good old memories of Oman, my friends and wonderful people and places of Oman. Hope everthing will be fine and I wish and pray for all of them. Hey, I am visiting your blog for the first time. My best friend is there as well and he sent me some pictures that were..umm..not pretty. I just hope all is fine soon for nine tenth of Kerala lives there. its quite sad to see places like qurum heights like that..i wonder whats the status with good ol al ghubra…u stayin in the same place now ? Yes, I was rather surprised when I heard about the rains. Things are pretty bad over there right now. There’s a lot of damage. How did you find out about my blog? Yes, things aren’t so great there now. I am hoping there is some way for international help to flow in. I hear that there is a water shortage. Also, there’s going to be a need for a lot of reconstruction. Qurum Heights. Rather ironic that the whole area would be submerged huh? 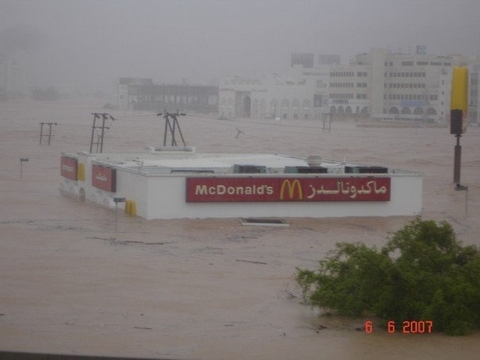 I remember that McD’s – it’s crazy to see it submerged like that. Yeah, I wonder how the school is doing. It was in a sort of low-lying area too! My parents moved from our old place. They are in Azaiba now. Yes, I heard about the water shortage. My friend apparently had to go to some office to use the restroom. Deos to the rescue! Jobi is a very good friend of mine. That’s how I found out about your blog. Viv – keep us posted, I called you up today, pray that your family and friends are ok and for everyone out there. Glad that aunty/uncle’s place is higher up – but they havent gone back at all yet right? If you hear of any international donations send me a note (or I am assuming you will blog it) and I will pass it on to everyone. Your page is first on Google when searching ‘Submerged McDonalds’ or ‘McDonalds Submerged’. That is an outstanding picture. I wish all McDonalds were inaccessible. Though, I wish the best for the people in Oman.